Definition at line 236 of file llvoiceclient.h. Definition at line 3024 of file llvoiceclient.cpp. Definition at line 255 of file llvoiceclient.h. 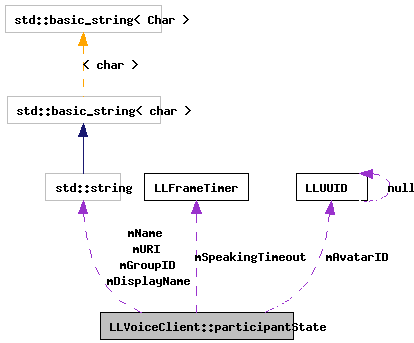 Referenced by LLVoiceClient::addParticipant(), LLVoiceClient::findParticipantByAvatar(), LLVoiceClient::participantStateChangeEvent(), and LLVoiceClient::removeParticipant(). Definition at line 254 of file llvoiceclient.h. Referenced by LLVoiceClient::addParticipant(), and LLVoiceClient::findParticipantByAvatar(). Definition at line 242 of file llvoiceclient.h. Referenced by LLVoiceClient::getDisplayName(), and LLVoiceClient::onAvatarNameLookup(). Definition at line 250 of file llvoiceclient.h. Definition at line 244 of file llvoiceclient.h. Referenced by LLVoiceClient::getIsSpeaking(), and LLVoiceClient::participantPropertiesEvent(). Definition at line 246 of file llvoiceclient.h. Definition at line 241 of file llvoiceclient.h. Definition at line 251 of file llvoiceclient.h. Definition at line 247 of file llvoiceclient.h. Referenced by LLVoiceClient::getCurrentPower(), and LLVoiceClient::participantPropertiesEvent(). Definition at line 243 of file llvoiceclient.h. Referenced by LLVoiceClient::getPTTPressed(), and LLVoiceClient::participantPropertiesEvent(). Definition at line 249 of file llvoiceclient.h. Definition at line 245 of file llvoiceclient.h. Definition at line 240 of file llvoiceclient.h. Referenced by LLVoiceClient::addParticipant(), and LLVoiceClient::removeParticipant(). Definition at line 252 of file llvoiceclient.h. Referenced by LLVoiceClient::getUserVolume(), and LLVoiceClient::setUserVolume(). Definition at line 248 of file llvoiceclient.h. Definition at line 253 of file llvoiceclient.h.